3D Printing and Desktop Fabrication are great examples of how forcefully technology is getting ever faster, cheaper, and better. I’ll start this topic off with my recent personal experience building a cheap but exceptional 3D printer from a kit that costs about $150. Contents of the Kit as shipped. It might look a little intimidating to some but it really just took some time and patience. There are many videos, manuals, forums and other help available out there an Iterative Search away. 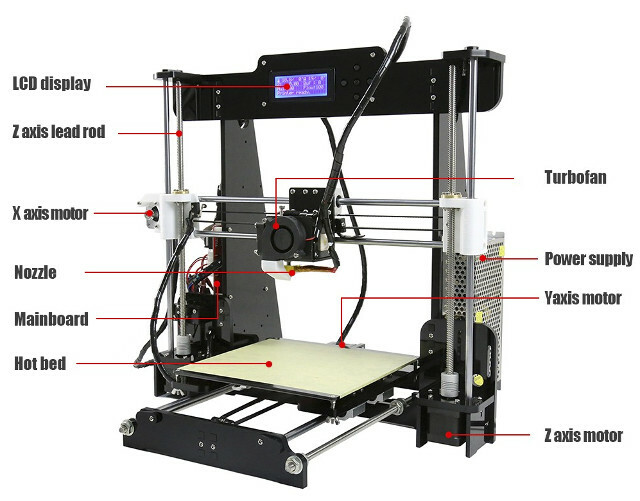 Below are a couple of videos of the assembled 3D printer kit in action. It is an Anet A8 I bought from China via ebay.com (see specs below). I added a glass plate to the bed, hairspray for stickiness, a spool of PLA plastic, and downloaded free software (CURA, Meshmixer, Blender, 123d Sketch). You can use the software to build your own designs or download from a vast selection of free design files from Thingiverse, 3DWarehouse and many other places. This printer is amazing as you can see from the two videos below. Printing the Headware was not too bad but it did require adding supports that need to be trimmed and combined with the other parts. You can buy the Headware already printed and assembled but it costs more than the printer did. (Note: to make it OpenBCI actually work you have to buy the chips, sensors and such and download the software). Below is a report of top rated printers from 3dPrint.com including the one above. Wow! Just another example of the blazing speed of innovation in Exponential Technologies. Just incredible. And, there is much more. Sometimes called simply 3D, the Third Industrial Revolution or Maker Technology, Desktop Fabrication is already changing the world dramatically. From design tools to 3D printing and Computer Numerical Control (CNC) machines, these innovative tools mean making things is getting easier and more sophisticated And, as usual, its accelerating. Desktop Fabrication combines Computer Aided Design (CAD) software, robotics and other technologies to provide a basis for extreme advancements in manufacturing, prototyping, and customization. Not to mention the possibilities of empowering the individual with cheap and exceedingly great tools for making things. Such a dramatic shift in this sector of technology took a pretty short time. And this is only the tip of the iceberg now that many patents have expired. Look out. Here are a couple of videos on the future and the basics of 3d Printing. 3D Printers use something like an inkjet printer with the added dimension of layers. It simply prints a layer with a prepared material, rather than ink, then shifts and prints the next layer, hence 3D. While the materials started with plastics and such, metals and other materials are now being printed into 3D objects. Some with capabilities far beyond previous technologies. A Computer Numerical Control (CNC) machine uses Computer Aided Design (CAD) software to convert design into Coordinates. Once the design is exported to the CNC machine, it cuts the object away a material like a sculptor would, but much faster and more precise. CNC machines have been around for a long time at the industrial scale. Like other sectors, they are advancing very fast and becoming more economical at the same time. The combination of CNC and 3D printing provides the foundation for extreme advances all over the globe and beyond. One of the most interesting aspects of Desktop Fabrication is that it scales very naturally. Think of the potential of a small 3D printer and/or CNC machine can make parts for a bigger version of itself, then something else entirely. There are already versions of this kind of scaling up being deployed. The implications of such scaling in terms of exploring space, the concept is incredibly powerful. For example, one could harvest materials to print/cut from resources on an asteroid or planet and use small machines to make larger ones. Ship a robot and a couple of small Maker machines into space and they potentially can build bigger and bigger versions of themselves and everything else humans would need they need from almost any material found on location. Deployed in space, these output products can scale up to build cities and eventually in similar fashion atmospheres if needed. Sometimes a project will be as simple as landing on an asteroid or comet and building something that will be able to change the natural trajectory of the celestial body to bring it back to where it can be properly mined or boarded to get somewhere out in the galaxy. But what about the printing materials. Well, first, don’t just pick any rock in the night sky. Find one that has materials that can be mined and molded into construction materials for 3D printing or solids that can be cut down for really strong, large objects. And, Nano Fabrication will not be far behind where things are done at the molecular level. Desktops and AI will design things and Nano Printers will print them out. These Nano Printers often will be really small and be able to print more of themselves and parts for bigger printers, CNC Machines and tools, among other things. Who knows, Nano Fabrication might might just be alchemy. It sounds crazy, but so do a lot of things that seem to occur around us as Exponential Technology changes the fabric of the Universe.